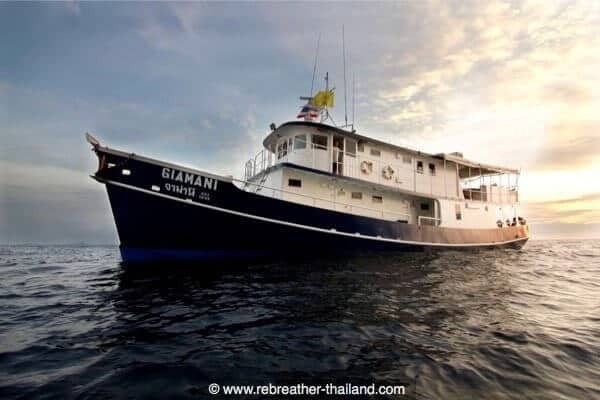 The MV Gimanai is a luxury and charming Liveaboard vessel with 4 twin bunk bed cabins and 1 Master cabin all with en-suite bathrooms. All cabins have a individually controlled air conditioning. MV Giamani accommodate a maximum of 10 guests. The covered terrace is the place to relax, to enjoy a movie or read a book or to discuss the dives with other divers. 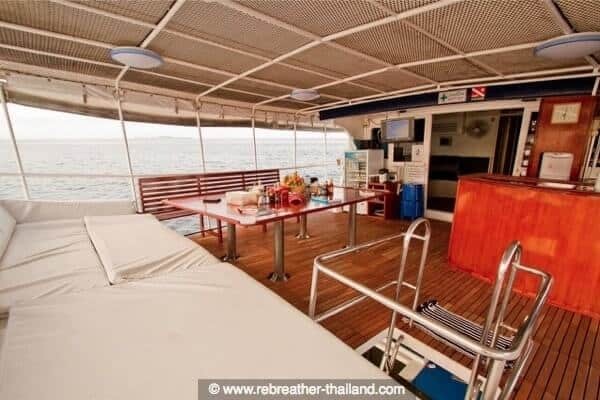 The dive platform is compact but spacious and well organized and the perfect entry into the magical realm of the Andaman Sea. A Liveaboard is especially suitable for experienced divers, because the dive sites can be challenging due to currents and the depths. An SSI Advanced Adventurer diving certificate (equivalent to PADI Advanced Open Water Diver) and Nitrox diver certification can be made in advance in Phuket at special conditions. General information about Scuba Diving in Phuket you find here. Welcome aboard – We can accommodate scuba divers, sidemount and rebreather divers. 4 Days / 4 Nights – 14 dives – The schedule you do on the boat varies with the currents and the tides. The tourleader and captain will do the best option for you. We pick you up from your local hotel at around 4pm. 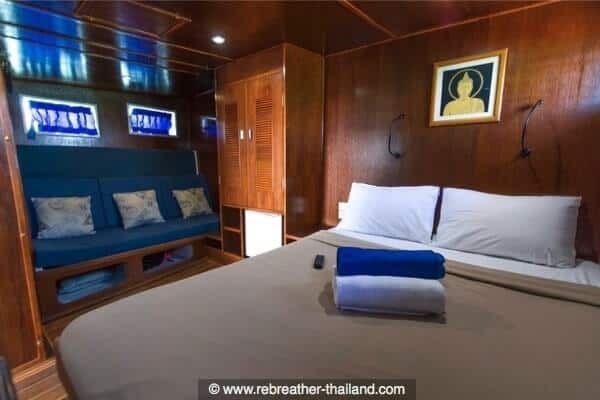 We will allocate cabins and then set up equipment after a short boat briefing then you can relax during the travel time to the islands, with a light evening meal. First Class Service, Excellent food and Accommodation in En-suite Cabins makes this liveaboard a truly 5 Star experience. O2 and Scrubber is available for the Rebreather Divers. Nitrox is available by pre-booking only and on a surcharge (see price list). On board are scuba cylinders both with DIN and Yoke fittings, 2 air/nitrox compressors available. Each diving group is kept to a ratio of maximum 5 divers : 1 Dive Guide ensures your safety at all times and showed you the hidden gems of the Andamansea. Boat and dive site briefings are given during your Liveaboard trip. Unlike others we store, wash and transfer your privately owned equipment. Just jump on board and relax. If you have your own equipment – great, bring it with you for the dive trip. After diving, we wash, dry and store it for you at our dive center. When you go diving again, we will pack it for you and deliver it to the boat. If you need to rent scuba diving equipment, either a full set or partial, please let us know when you book your diving excursion. Available equipment and prices, you can find on our price list. We also have spare equipment on board like wetsuits, fins, masks, regulators and BCD’s ensuring that a malfunctioning piece of equipment won’t ruin your day! We believe you always should dive with good quality scuba gear, even if you don’t buy your own. You deserve the best state-of-the-art equipment, so we’ve got it! We work hard to keep our rental equipment in top condition. We have a strict maintenance schedule for the overhaul of our regulators and BCD’s. Our rental wetsuits are replaced regularly. We will gladly explain the functions of any of our dive equipment and repair or replace any piece of your own equipment if requested. We want your dives to be fun, safe and free from equipment issues. 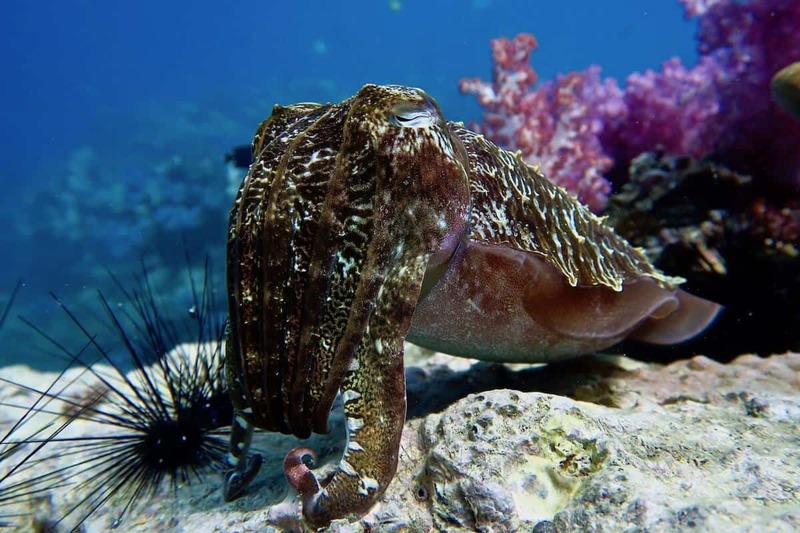 I want to see Sharks, Mantas and Turtles – You need to be lucky, but as a passionate diver you hopefully will enjoy also all the other great and rare creatures at Phuket’s popular dive sites. Let yourself amaze about the bunch of various marine life and the divine underwater landscape. Get in touch with Aloha Diving and open the gate to a mystic world.